Feeding one's baby is one of the most important things that a parent can do not only for the child's current survival but for future health as well. It is important for parents to be aware of what they are feeding their infants from the time that they are newborns through their first year of life and beyond. This is particularly true when it comes to weaning children off of breast milk or formula, as there are many potential food allergies. Parents cannot know which of these allergies, if any, their child has until they have a reaction. This makes introducing new foods a daunting task. Additionally, there are some foods that babies simply should not be fed, as they can make them ill or even result in their death. To avoid known dangers and to safely introduce high-risk foods, it is important for parents to recognize what items may potentially present a problem and when it is safe for babies to try them in small amounts. It is also important that parents know what food items to steer clear of and for how long. Clostridium botulinum is a bacterium with spores that may be found in honey. If these spores are consumed and enter the immature intestines of a baby, they can grow and release a toxin that cause infant botulism. Infant botulism is considered a medical emergency and is referred to as a paralytic illness by the CDC. It can affect both muscle movement and breathing, and in some cases, it may result in death. This can occur even if a baby is fed a very small amount of honey. For this reason, babies under the age of 12 months old should never be given any amount of honey. While the milk from a cow is safe for older children and adults, it is not safe for infants who have not reached their first birthday. Cow's milk does not give infants the nutrients that they need during this stage of their lives. These necessary nutrients include fatty acids, vitamin E, and iron. Additionally, babies cannot properly digest the fat and protein that is found in cow's milk. Like cow's milk, soy milk is not suitable for infants under the age of 12 months. Soy milk also does not contain the necessary nutrients babies require, and its use can result in iron deficiency and other problems. Breast milk is the preferred choice when feeding babies. If breastfeeding is not an option, soy-based formulas may be used; however, soy formulas and soy milk are not the same and should not be used interchangeably. Pine nuts, almonds, walnuts, cashews, Brazil nuts, and pecans are all examples of tree nuts. For some people, tree nuts can be highly dangerous and eating them may lead to death. Because of this high risk, it is important not to introduce nuts into a baby's diet too soon. The most recent guidelines regarding when tree nuts may be safely introduced to babies state that the child should be no younger than 6 months old; however, if there is a family history of nut allergies, they should be introduced when the child is a bit older, at 12 months or later. Because of the potential severity of nut allergies, it is crucial that parents speak with their pediatrician before attempting to feed tree nuts to their baby. Tree nuts also pose an additional danger to infants as they may be a choking hazard due to their hardness and small size. Parents will want to exercise caution if feeding nuts to children under the age of 2 years old to avoid choking. Children should not be fed whole nuts until they are 4 years old to prevent accidental choking from occurring. A peanut is not a nut, despite what its name suggests. When people eat peanuts, they are actually eating legumes. Like nuts, however, peanuts pose an extremely high risk of a deadly allergic reaction. Current recommendations for peanuts are similar to those for nuts. Babies may be introduced to peanuts between the ages of 6 months and 12 months. They should not be given peanuts early if a sibling or any other member of the family has a history of peanut allergies, as their risk is greater. The stickiness of peanut butter represents a choking hazard for infants, as does the size of whole or chunks of peanuts. This adds another level of concern when feeding peanuts and peanut products to infants and babies. Cooked eggs may be introduced to infants as early as six months old. Introducing an infant to cooked eggs at this early of an age may help to reduce the risk of egg-related allergies. To start, only feed the baby small amounts at a time to ensure that there is no reaction. When feeding an infant eggs, make certain that both the egg white and yolk are thoroughly cooked and never runny or raw. Strawberries put babies at risk in several ways. The risk of an allergic reaction when eating raw, unprocessed strawberries means that babies should not be fed them until after the age of 6 months. If not properly cut to a safe size or pureed, strawberries may also be a choking risk. Strawberry seeds are very small and proper digestion may not occur, resulting in the presence of seeds when the baby has a bowel movement. This is harmless and not a source of concern in terms of whether the child is allergic or not. Shrimp, lobster, scallops, and crab are all types of shellfish, and each carries a high risk of allergies. As with other foods, they may be introduced to babies who are 6 months or older. 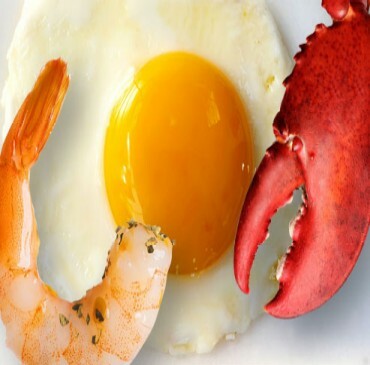 If there are family members who suffer from shellfish allergies, parents should wait closer to one year before introducing shellfish to their children. Certain types of fish, including swordfish, king mackerel, marlin, and shark, contain high levels of methylmercury. Methylmercury is a form of mercury that develops in fish that swim in waters that contain high levels of mercury. It affects the brain and nervous system and can cause a number of problems including, but not limited to, future memory problems. Avoid feeding infants any fish that are known to have high mercury levels. An infant's kidneys can only handle so much salt, and for that reason, there is no need to add it to their food. When feeding babies table food, check the labels and the amount of sodium that is in the food. Children who are given sodium in their food at an early age may develop a preference for it in their food as an adult. Because sugar has no nutritional value for infants, there is little to no reason for it to be a part of the diet. Introducing sugar at such an early age can, however, result in lifelong problems such as tooth decay. By limiting or eliminating sugar, children do not develop a craving for it, which can be beneficial for future health. During early feedings from a bottle, parents should be aware that choking can occur, particularly if the baby is left with a bottle that has been propped up for feeding. Choking may also occur if young babies are fed cereal from their bottles, as their swallowing reflexes are not yet fully developed. As babies are introduced to food, parents must be aware of the increasing risk of choking. Food items that are hard, round, slippery, extremely sticky, or large can be a choking hazard for infants. Depending on the age of the infant and the food item in question, it should be pureed so that infants can eat it without risk, cooked and mashed, cut into small pieces, or not given to babies at all until they are old enough to safely eat it. In addition to nuts and peanuts, parents must be cautious of feeding infants grapes, seeds, any type of meat, vegetables such as carrots, or fruit, for example. What Can I Do to Prevent Infant Choking?